Ride along in our open-aired electric shuttles as we drink our way through our top 4 favorite Margarita spots from the Visit Dallas Margarita Mile in this all inclusive, three-hour guided Tour! Sample over 7 of the best Margarita's Dallas has to offer! Learn the history of the Frozen Margarita and how it was created in Dallas. We will even throw in some fun facts about what makes this city so great! Are you a Margarita Lover? 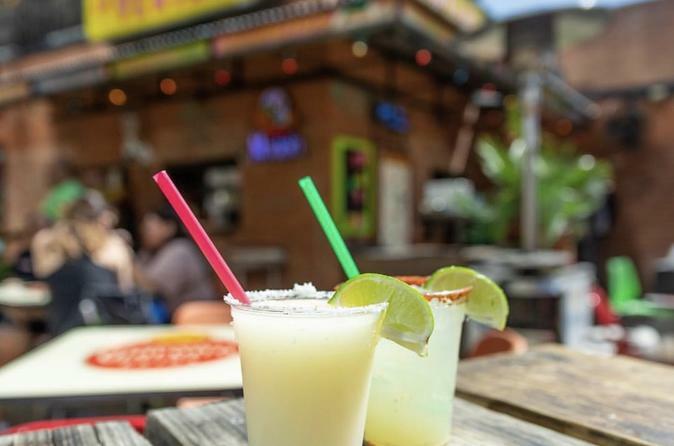 You won't be disappointed with the Dallas Margarita Mile Tour! Your fun open-aired electric shuttle has arrived. Time to jump in and head to our first stop, The RUSTIC, for our first flavorful margarita, the Rimy RITA! A fun mix of color and a blast of flavor. This marg is famous for it's added treat, a delicious WINE infused popsicle! Bust out your camera, this one is certainly photo worthy! We keep the party going with our second stop, Mi Cocina for a flight of Margaritas. You heard that right. We get to sample four of the best margaritas Mi Cocina has to offer. Including every local's favorite, The MAMBO TAXI! Ask any Dallasite, and they will tell you, this may be the best, if not most famous margarita in Dallas! Stop 3 has margs so good, we couldn't choose the best one, so we are letting you decide. Choose between the oh-so refreshing avocado Margarita, or the beautiful Pineapple Jalapeño Wild Rita! But don't worry, there isn't a wrong choice, they are both delicious! Last but not least, we are heading to the Dallas Farmers market for our last stop, Taqueria La Ventana. A classic that will never go out of style is a true original lime margarita. Frozen or on the rocks, the choice is yours! Grab it to-go as we walk around and check out a Dallas-Must-Do, The Dallas Farmers Market!